It can be difficult to remain level-headed through all the hustle and bustle of preparation for a wedding, but technology has made the situation much more enjoyable with many entertaining and informative podcasts. After all the excitement of being introduced to that gorgeous engagement ring, you’ll need something to keep the momentum heading in the right direction. Finding a podcast to guide your journey and put a smile on your face along the way can ease the stress of wedding preparations, and remind you of the true reason you chose to go through the struggle of planning a wedding in the first place. Check out a few of the best, and find your pick-me-up today. Aleisha McCormack is the host of this podcast. Posting twice a week, Bridechilla has over 200 episodes from which to choose that cover just about every aspect of taking life’s biggest plunge. Not only is Aleisha hilarious, she knows just how to present even the most mind-numbing of situations in a more appealing light. There are so many different topics from which to choose that you’ll want to continue following Bridechilla even after you’ve said your vows. 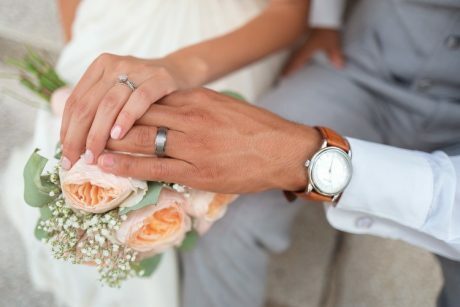 Host Shaina Franco tackles even the toughest of challenges faced by engaged couples, and she even manages to pick out a few issues that no one really thinks about. From showing you how to secure hotel blocks to planning the honeymoon, Franco presents solutions in a sincere, competent way that makes her extra lovable. Engaged is a podcast for couples who have recently made the pledge to tie the knot. It can be difficult to know where to begin planning your wedding, especially if you haven’t done it before. Hosted by Kali Edwards and her fiance Ryan, Engaged is a collection of podcasts that follow the couple’s journey from engagement to their wedding. The couple tackles questions of cultural tradition, being pregnant while planning a wedding, and several other real-world topics concerning the journey from engagement to marriage. From Ring To Veil is the essential wedding planning 101 pal you had no idea you needed. Nearly any situation you encounter is discussed during this Apple-exclusive podcast. Learn how to handle unpredictable weather conditions on your wedding day, and how to deal with post-wedding bouts of sadness.